A fun-loving “designer dog” TLC Kennel combines only first generation Toy Poodles with Yorkshire Terriers to create the preferred smaller Yorkiepoo. 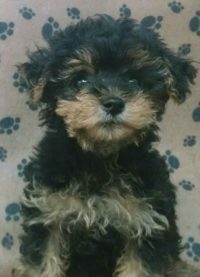 The Yorkipoo has a low-dander, low-shedding coat, and is happy in many different types of homes. They make an excellent companion for the elderly and with their gentle and loving disposition, the Yorkipoo has proven to be a successful therapy dog as well. These happy-go-lucky little guys have plenty of energy and love to play when not parked on your lap just chilling out with you.